Future World, Epcot, contains one of Disney’s most innovative and unique rides. 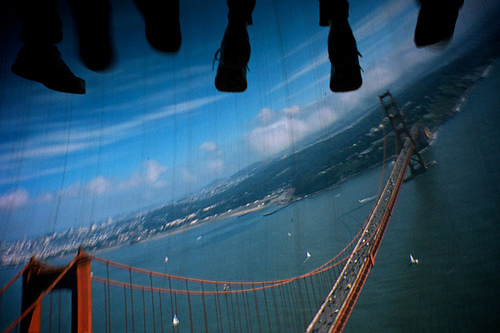 Soarin’, the high-flying adventure over California, is one of my personal favorites, and gives riders a distinct feeling of weightlessness. The premise behind the ride is a simple one: you get to view iconic areas of the Sunshine State from a hang gliding-like perspective. The ride itself, if you want to get technical about it, is really just one giant projector screen. But as you’re lifted off the ground in your tiered elevated chairs, your feet dangle in front of you as the projected images surround your view. You soar over places like the Golden Gate Bridge, Napa Valley, Yosemite National Park, Los Angeles, and even the Disneyland California park itself. Several of the scenes infuse a distinct scent, such as the salty ocean as you fly over Malibu, or evergreens as you fly over the mountains. The ride really does feel all-encompassing, and when you “land” it seems as if you’ve actually been to the places on the screen. Soarin’s sense of realism is unparalleled, and its finale (Christmas fireworks over Disneyland) is truly breathtaking. Be sure to check this one out if you’re in The Land—it’s worth the wait.